I've had the privilege of leading or participating in many memorable new business pitches over the years. Some have been memorable for all the wrong reasons. Others, though, have been worthy of an Oscar for best direction, writing and performances by the lead and supporting actors and actresses. – Turning the conference room of my one-time agency employer into an exact replica of a New York subway car to pitch the TransitCheck account. The team dressed as train conductors, ticket booth personnel and your average strap hanger. We won the account. – Transforming Peppercomm's old fifth floor conference room into an exact replica of the soiled, sordid habitat of the Teenage Mutant Ninja Turtles to pitch the 25th anniversary of the fabled troupe. We even served pizza (and had our plan written in Magic Markers on the inside cover of the pizza boxes). We won that one as well. – Transforming the very same fifth floor conference room into an uber cool, after-hours cocktail bar to pitch the Absolut Vodka account. We had several team members dress as liveried waiters and waitresses to take the prospect team's lunch and drink orders. Alas, we not only didn't win the business. We never, ever heard back from the Absolut folks. Absolut silence! My all-time favorite new pitch, though, remains our wild and wacky presentation to one of the oldest and most respected names in business & industry: GE. Back in 2000, Jeff Immelt had succeeded Jack Welch as CEO and immediately changed the conglomerate's business model AND brand promise (which went from: 'We bring good things to life' to 'Imagination at work'). Because we had earned rave reviews from GE's financial services people, the then tiny Peppercomm team was invited to 'wow' the GE corporate big wigs with our imaginative presentation and thinking. We went all out (figuring we were a long shot from the get). Knowing that Thomas Edison had founded GE, and was easily one of the most imaginative homo sapiens since DaVinci, we brought him along to the pitch. That's right, we dressed team member Ted Birkhahn as Edison's body double, had him hide in a men's room until just the right moment in our presentation and announced that Thomas Edison had returned from the grave. Ted/Thomas strolled into the Airbus 300-sized conference room to announce he was running for the presidency and launching a new third party with a single plank: injecting imagination into the political process (ironic considering today's Beltway malaise, no?). Ted/Einstein proceeded to read a speech announcing his candidacy and we told GE how we'd use their locomotives to recreate an old whistle-stop political tour whose intention was not to elect an Edison lookalike but, rather, to re-position GE, drive home the new imagination theme AND inspire Messrs. Bush and Gore to inject more imagination in their thinking. We were hired and implemented the imagination at work campaign (sans Mr. Edison, though. 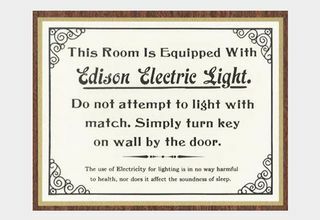 The Edison Foundation told us that was a non-starter). 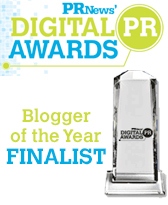 We also won lots of awards and kudos for GE, and my favorite PR firm. It's rare to see the ideas that win a new business presentation actually be implemented. Rather, the meetings are intended to demonstrate an agency's thinking and capabilities while assuring there's a real chemistry mix between both parties. I'm really proud of our out-of-the-box pitches, especially Ted's Tommy Edison knock-off. That said, I'm STILL waiting to hear back from Absolut. Maybe they should run an Absolut Rude advertisement as a long-overdue apology? Or, how about one entitled: 'Absolut Genius' starring Ted as Edison? I one had Alliant Tech Systems as an account. They made ammunition for the military. I suggested they adopt the tagline, “We bring good things to death.” That didn’t work out so well.